There will always be dates in the diary that are seasonal ‘musts’ and Theatre in the Forest has become one of these for me. 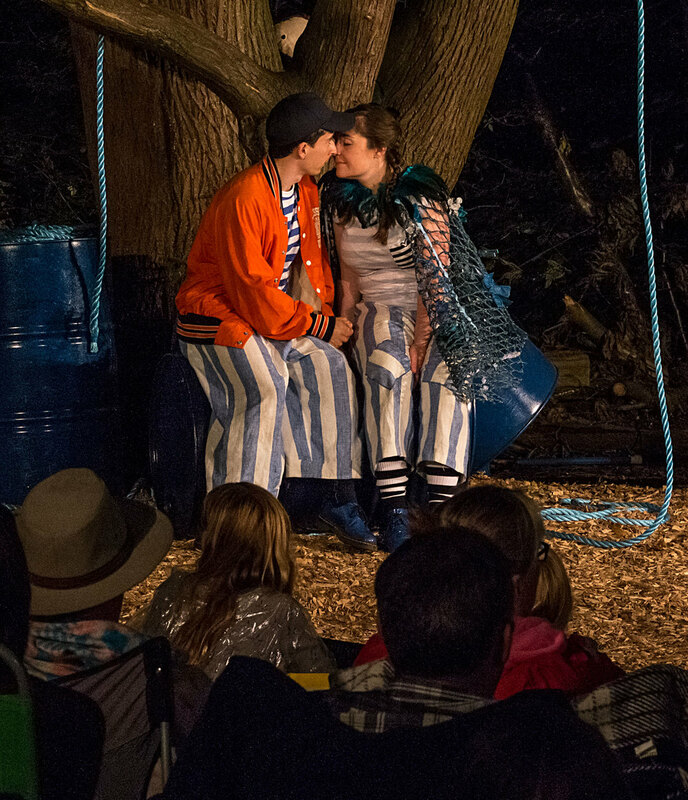 Combining two of my most favourite things – theatre and being outdoors – I’m hard pushed to think of many better ways to spend a summer evening than enjoying the latest Red Rose Chain production in the woodland setting at Jimmy’s Farm. On a very warm July evening it was both a balmy and slightly barmy experience! I wasn’t very familiar with The Tempest – but one of the great things about Jo Carrick’s interpretations of Shakespeare is that, familiar or not, dull or testing moments are few and very far between. I’m not suggesting that I was able to follow every single line and progression of the story precisely but that really doesn’t matter. The company are so engaging, the setting so imaginative and the action so fast paced that missing the odd message here and there really isn’t an issue – and after all there’s always the ever-so-clever ‘story in a nutshell’ comic strip in the programme to keep you on track! While you may never have thought of Shakespeare as a ‘barmy’ I assure you this version holds no prisoners when it comes to ringing the hilarity and slapstick opportunities from every scene. Children and adults alike were shrieking with delight as the ‘splash-zone’ (be sure you’re wearing your rain poncho) was hit time and time again with stormy waters and the like. The five players – Edward Day, Rachael McCormick, Jack Parker, Lawrence Russell and Kirsty Thorpe – work with incredible energy and adaptability to bring each of the characters to life, even changing from one to another seamlessly on stage at times. They use the space and the surroundings so effortlessly, drawing the audience into their world that we were soon consumed in their creation. Even the roosting fowl from the farm played their parts on cue, adding to the sounds and the wonder of outdoor theatre. So, if you’ve ever wondered whether Shakespeare is for you – this is your chance to find out. Be ready to laugh, be prepared for hilarity and clowning, there’s even a sequin-clad disco tribute but all in among the rustle of the trees, the sounds of the farm and of course the fresh Suffolk air!